Creative play and artistic activities have a central role in toddlers’ learning and development. They help nurture imagination and also develop problem-solving, thinking and motor skills. At home, Arlo and Macy love activities like finger-painting, pasting, colouring pictures, and folding or ripping paper. These activities might be a bit messy (argh! ), but I know that they are helping them learn. 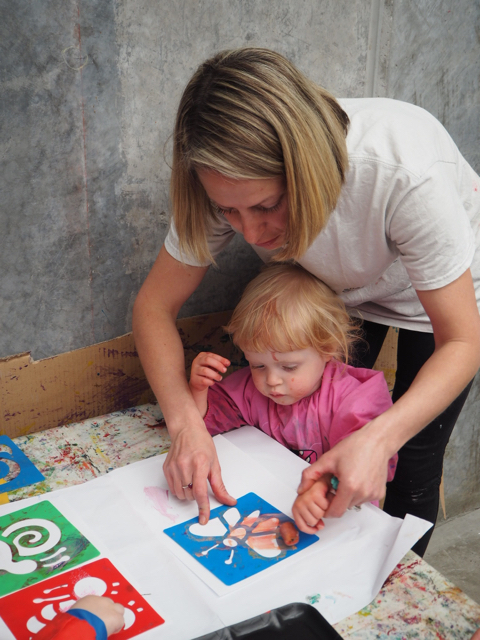 Little Art Big Art offers a range of carefully planned art classes for tiny tots to adults. Founded by professional artist, primary school art teacher and mumma of two, Rachael Morris, Little Art Big Art is about imagining, creating and celebrating art and we think that sounds like super fun! We arrived at Little Art Big Art ready for a jam packed session in the Tiny Artists program and were welcomed into the studio by Rachael. Whilst a few last minute finishing touches were made to the studio space, the poppets were kept busy with a basket of colourful whiteboard markers to draw on a big glass panel. Rachael explained to us that the focus of each session is for the children to develop an understanding for the creative process whilst learning how to use a range of art materials. Each week she plans three to four art concepts based around a particular theme that also secretly targets various skill development. As more little artists arrived, Rachael announced that this week’s session was based on the theme, Nature Art and invited the little ones down to the floor to explore the sensory colour play station which comprised of big shells, wooden pegs, little toy lizards, colourful rocks and plastic spoons/scoops. It wasn’t long before curiosity got the better of the poppets and they joined Rachael at the table where the water play station was set up. What is it about playing with water that children find so fascinating…? On the table were four deep aluminium trays (filled with a few centimetres of water) and a platter of flower petals, leaves, flower buds and herbal teabags. 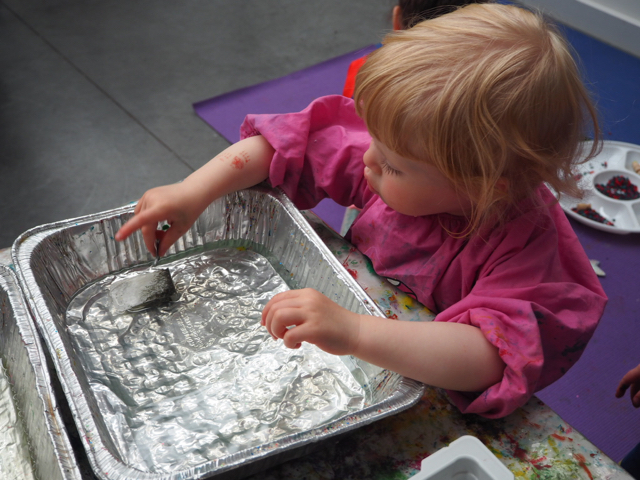 The children were encouraged to smell each item and explore them with their hands as they added them to the water. I particularly loved watching Macy dunk the peppermint tea bag up and down and watch in amazement as the water started to turn a shade of green. With the inclusion of water colour paints (added by using medicine droppers), the poppets had successfully created a wonderful garden soup. Mmmmm delicious! Once the water table had been exhausted (or was it that we were exhausted from cleaning up all the water being splashed around?! ), we moved onto painting! On the main table small easels were set with a piece of paper and had a large green leaf stuck to the centre for the kiddies to paint over or outline around. 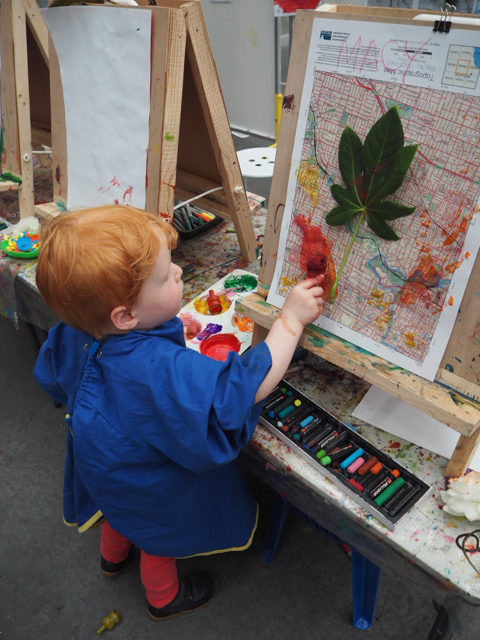 Arlo took great interest in painting on the leaf and even using a little yellow daisy instead of a paint brush! Macy joined Rachael for a one-on-one tutorial on how to use the small paint rollers and colourful paint to create artwork with stencils, which quickly turned into a fun finger painting activity! While our two were busy, a few of the older children were using big fat leaves to paint a sheet of paper that had been stuck to the wall. They loved splatting the paper with their big leaves and even tried to paint each other! Hehehe! The no rules/no mistakes approach to the Tiny Artist program at Little Art Big Art not only provides a wonderful, stimulating and engaging experience for children but also allows parents to pick up art ideas that they can easily replicate at home. The small class sizes allow them to give attention to the individual needs of each mini artist and the best bit – they do all the cleaning up! Art is messy, so dress your child in old clothes or ones that you are happy to continue using purely for art activities. Art smocks can be provided if necessary. The weekly Tiny Artists program is suitable for children aged 1-5 years. There is also a Little Artists program which is designed for kindergarten children aged 3-5 years. Every month Little Art Big Art offers free workshops that are proudly supported by the Hobsons Bay City Council’s Arts and Culture Department. These workshops are held at the Woods Street Art Space, Laverton. Check out the website for information about children's parties and adult classes too. For more information about Little Art Big Art classes - head to their website.